DOOM Review | Nerd Much? When a highly anticipated game like DOOM finally releases, it can be incredibly tough to remove yourself from the hype while you’re reviewing it. In fact, even as I booted up the game, I couldn’t contain my own excitement and was swept up in hypeville. But after being blown away by the incredible graphics (which I’ll get to later, of course), and the initial excitement, DOOM oddly started to feel like an empty experience that just wasn’t up to par. Sure, anyone could argue that you should know what you’re getting yourself into when you pick up a DOOM game, and they’d absolutely be right. But, I think that becomes a problem when you factor in that the franchise hasn’t been heard from in over ten years (12 to be exact). Shouldn’t the game be upgraded in more ways than just getting a graphical overhaul? That’s the core problem with Bethesda’s newest, DOOM. What you’ve got here is a solid initial experience that grows stale rather quickly. In the single player campaign, you’ll basically enter a room, kill all of the demons inside, and move onto the next kill chamber, picking up health and ammo where you can. You’ll also pick up new guns — there are eight in total — and armor throughout each chapter, finding a few upgrade points and secrets along the way. But at its core, the game has you basically running into a large room, frequently running around in a circle around your new demon friends until they’re all destroyed. What starts as a frenetic and enjoyable experience slowly turns into a rinse and repeat cycle, with very few variations thrown into the mix. It’s not all a middling experience, though, as there are some redeeming qualities. First and foremost, the new Glory Kills system is a great addition to the franchise, allowing you to save your bullets by performing ultimately fatal finishing moves to dazed demons. What’s more, it turns your DOOMguy into the ultimate soldier, making you feel like an unstoppable badass. It’s with these Glory Kills that you find extra health, as each Glory Killed-demon drops health refills upon their demise. Secondly, there’s a rather hefty portion of weapon variations to be unlocked and tinkered with, and it’s this system that allows those eight core guns to feel like 20 or so different weapons. You can add things like a bigger spreadshot to your shotgun, or missiles to the heavy assault rifle. I’ll also make a quick note to give a shoutout to the chainsaw, the real MVP of DOOM. Forget about the BFG that we’ve all used before — and yes, you’ll use it again in this game as it even gets its own dedicated button — because the chainsaw provides the ultimate killing experience, allowing you to split your enemies in two, leaving them as a hot, bloody mess of body parts on the floor. Gas supply to power your chainsaw is in short supply, so you have to use it sparingly. Luckily, using the chainsaw to cut up some guts drops a ton of ammo for the rest of your guns, making it an essential tool to use when plowing your way through the waves of demons. Within the game you’ll find numerous enemy types, ranging from drudging demons to large, truly hellish brutes. Some throw fireballs, others have shields, and some have super tough skin that make them feel like bullet sponges. 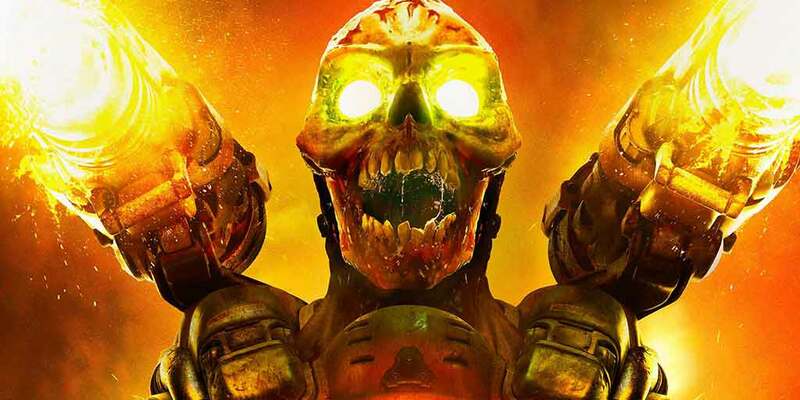 The common cannon fodder are formidable enough to keep you challenged, but it’s in DOOM’s boss battles that the challenge is upped to the nth degree. Typically in shooters, you’re given just big, massive bullet sponges that don’t require any sort of a strategy to take out, other than to simply point your gun and shoot. But Bethesda has taken a different route, making their excellent boss battles not only challenging, but the highlight of the campaign. These bosses each have their own unique abilities and attacks, and you’ll have to pick apart those attacks and find holes for getting your own shots in. They might be incredibly challenging, but that makes their defeat so much more blissful. 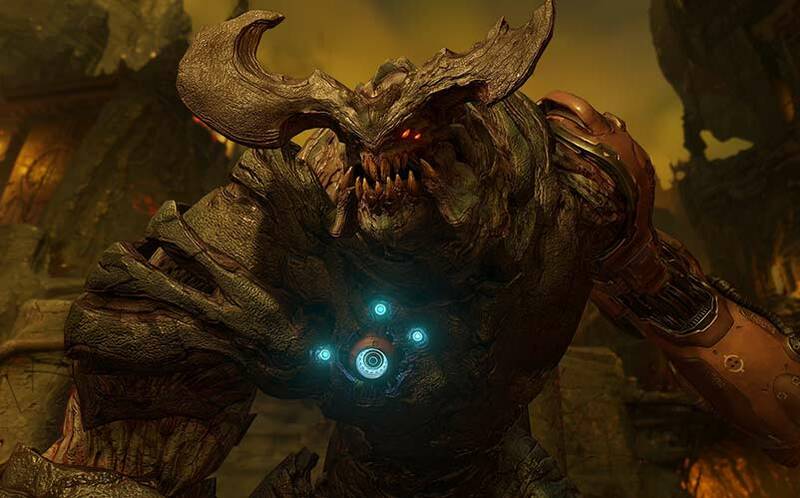 Although most come to play DOOM for the single player campaign, there are also many who care more about the game’s multiplayer mode. Luckily, Bethesda comes bringing the heat when it comes to multiplayer, bringing a much more ambitious offering than what we saw in the beta. Not only is there a slew of different modes, but there’s also a leveling up system that allows players to unlock new weapon customization options, perks, and weapons. At first, you’re introduced to a barebones customization experience containing a handful of options for not only changing the look of your character but the look of your weapons as well. After just a few online matches, you’ll be overwhelmed with the number of different unlocks you receive, and the customization system quickly becomes enjoyably overwhelming. 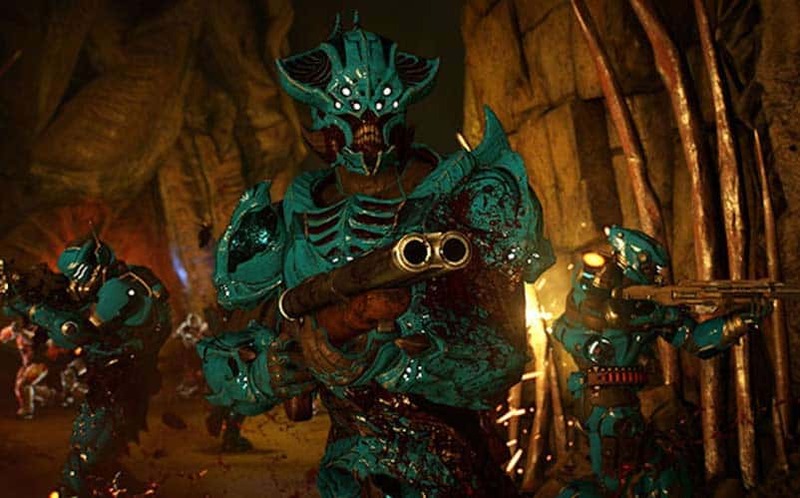 DOOM multiplayer is admittedly dumb, but it’s dumb in an enjoyable way; it’s dumb in that you can just hop in, kill a bunch of other players, and hop back out without really caring about how well you’re doing. 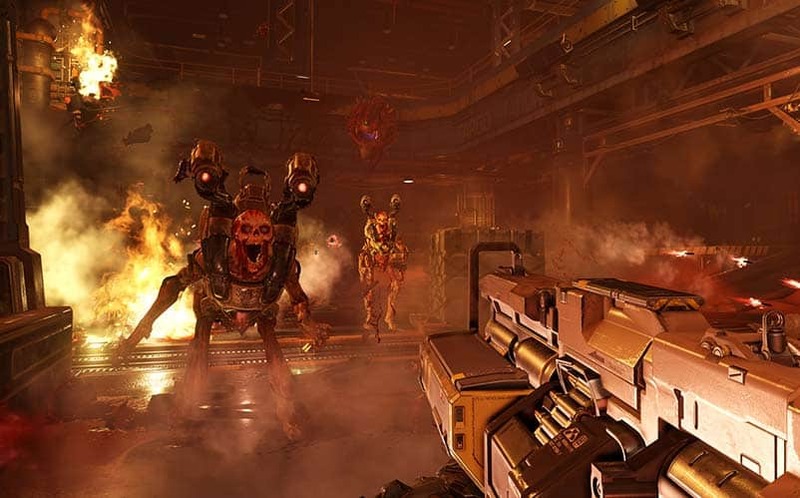 DOOM is the sort of game that allows you to run around like a chicken with your head cut off without feeling like your out of place, simply because that’s basically what everyone else is doing. It’s a genuinely fun experience, mostly due to its simplicity. I’d also like to note that I was pleasantly surprised that the servers worked on launch day, and even through the weekend, I haven’t noticed any downtime, lag, or issues pertaining to the servers. So often we’re plagued by broken servers at the launch of a game that the experience is ruined for us (as gamers) entirely. Generally speaking, DOOM is a good game. However, it’s important to note that it’s good, and not great, which is what we were all expecting and hoping for. It’s a game that surprisingly plays it safe and doesn’t do much to stand out from the crowded first person shooter genre. What makes it such a let-down is that it hails from a great developer like Bethesda, who has released great game after great game with very few missteps along the way. The single player campaign is fun for the first few chapters, but it quickly grows stale thanks to its repetitive nature. However, the campaign is redeemed by its excellent boss battles and badass Glory Kills. And when you pair that with a multiplayer experience that’s simply enjoyable, you’ve got yourself a trip to hell worth taking.